Indie Retro News: Adolfish - A colourful free adventure that comes with high frustration! 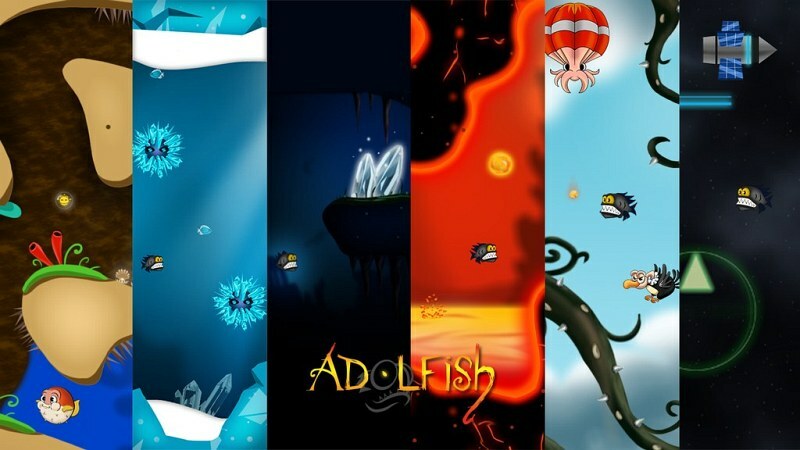 Adolfish - A colourful free adventure that comes with high frustration! If blasting enemies with a gun isn't to your liking, then how about a rather challenging, or shall I say frustrating game, that has a piranha and lots of colourful cartoon detail with plenty of bizarre enemies. Welcome to ' Adolfish ', a free PC 2D adventure game in which you play as a piranha called Adolf, on the hunt for food such as his favourite little red blowfish through many different varied worlds. Be warned however this game may look nice in a cartoon like way, with nice animation and very well designed trap layouts, but if you aren't frustrated by the later levels, then you are doing far better than most who have already played it. Still though, don't let that put you off, because with intuitive gameplay, and the constant need to try, try and try again, this game is still worth a play, especially as it's free! Comic and ironic artistic style. pleasant and frantic music in the excited moments that will accompany our adventure. Strange and elegant 6 worlds with different aspects (tropical, antartic, deep sea, volcanic, sky and space). The characters show you their moods through their facial expressions. Dying in Adolfish is part of the fun!